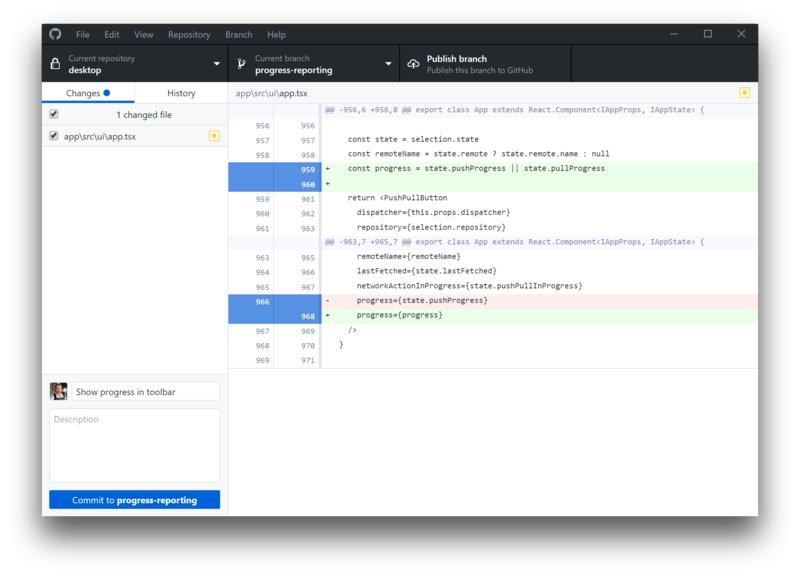 GitHub Desktop is an open source Electron-based GitHub app. It is written in TypeScript and uses React. There are several community-supported package managers that can be used to install Github Desktop. Arch Linux users can install the latest version from the AUR. You can install this alongside your existing GitHub Desktop for Mac or GitHub Desktop for Windows application. NOTE: there is no current migration path to import your existing repositories into the new application - you can drag-and-drop your repositories from disk onto the application to get started. Is GitHub Desktop right for me? What are the primary areas of focus? This document describes the focus of GitHub Desktop and who the product is most useful for. And to see what the team is working on currently and in the near future, check out the GitHub Desktop roadmap. Note: The GitHub Desktop Code of Conduct applies in all interactions relating to the GitHub Desktop project. First, please search the open issues and closed issues to see if your issue hasn&apos;t already been reported (it may also be fixed). There is also a list of known issues that are being tracked against Desktop, and some of these issues have workarounds. If you can&apos;t find an issue that matches what you&apos;re seeing, open a new issue, choose the right template and provide us with enough information to investigate further. The issue I reported isn&apos;t fixed yet. What can I do? If nobody has responded to your issue in a few days, you&apos;re welcome to respond to it with a friendly ping in the issue. Please do not respond more than a second time if nobody has responded. The GitHub Desktop maintainers are constrained in time and resources, and diagnosing individual configurations can be difficult and time consuming. While we&apos;ll try to at least get you pointed in the right direction, we can&apos;t guarantee we&apos;ll be able to dig too deeply into any one person&apos;s issue. How can I contribute to GitHub Desktop? The CONTRIBUTING.md document will help you get setup and familiar with the source. The documentation folder also contains more resources relevant to the project. If you&apos;re looking for something to work on, check out the help wanted label. See desktop.github.com for more product-oriented information about GitHub Desktop. The MIT license grant is not for GitHub&apos;s trademarks, which include the logo designs. GitHub reserves all trademark and copyright rights in and to all GitHub trademarks. GitHub&apos;s logos include, for instance, the stylized Invertocat designs that include "logo" in the file title in the following folder: logos. GitHub® and its stylized versions and the Invertocat mark are GitHub&apos;s Trademarks or registered Trademarks. When using GitHub&apos;s logos, be sure to follow the GitHub logo guidelines.